While the price of Bitcoin has plunged over 80% from it’s peak in late 2017, Bitcoin’s total energy usage has dropped less than 40%. 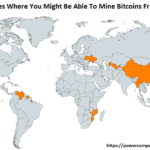 Nevertheless, as the map above shows, there are surprisingly still 10 countries where it may still be profitable to mine Bitcoin from home (although with some pretty major caveats). 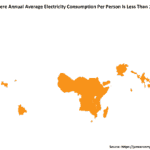 The map above is an update on last year’s look at Bitcoin electricity consumption. 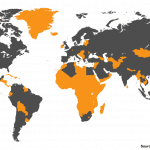 Currently, only 38 countries definitely consume more electricity than total Bitcoin mining. 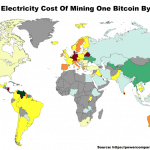 The map above shows a very rough estimate of the current electricity costs of mining one Bitcoin by country around the world. 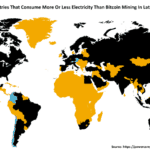 Based on our research, Kuwait is the cheapest country in the world to mine Bitcoins while the Solomon Islands would be the most expensive.